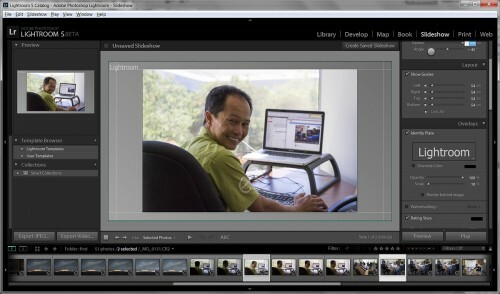 Adobe has released a beta version of their upcoming Lightroom 5 photography workflow and image editing program. 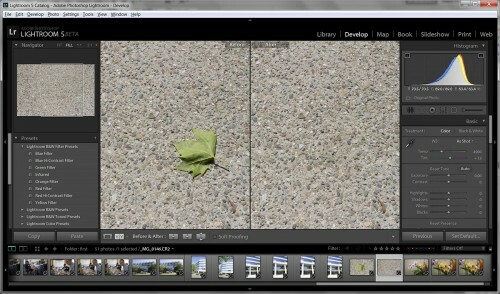 The beta is a preview of what we can expect when the final version of Lightroom 5 is introduced, probably this summer. Some of the exciting new features in the Lightroom 5 Beta are an Advanced Healing Brush, Radial Gradient tool, and “Upright” automated perspective correction. 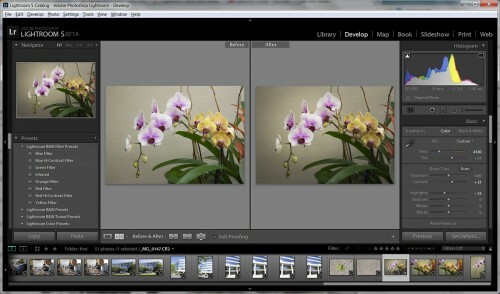 The Advanced Healing Brush is a seriously enhanced version of the Cloning tool that’s we’re already using in Lightroom 4. With the Advanced Healing Brush you’re no longer limited to spot cloning and healing. You use the new Heal brush to paint over objects you want to remove from a photo and Lightroom will automatically fill the painted area with matching content. If you don’t like the content Lightroom chooses, you can redirect it to an area you think is a better match. The Advanced Healing Brush makes it possible to do much sophisticated image cleanup and content replacement without having to go to Photoshop. Adobe has improved the cloning and healing algorithms in Lightroom 5, so we should also more refined results along with better control. The screenshot below is a quick test I made with the new Advanced Healing Brush. Watch the official Adobe video below the screenshot for a more detailed demo of the Advanced Healing Brush in action. The Radial Gradient tool is essentially a round version of the Graduated Filter that’s in Lightroom 4. It allows you to make soft, round masks that can be used to highlight your subject or for sophisticated vignette effects. Like the Graduated Filter, you can use any of the main Lightroom adjustments with the Radial Gradient tool – exposure, saturation, highlights, shadows, noise, etc. I made a screenshot sample (below) and I’ve also included an Adobe demo video showing how to use the new Radial Gradient tool. One thing to note is the Radial Gradient tool is sort of counter-intuitive. It’s a masking too so it applies adjustments outside the selected area. That confused me at first since I was expecting changes to appear within area I selected the Radial Gradient tool. Architectural, product and travel photographers will be psyched about the new Upright option, located in the Lens Corrections panel. It brings powerful, automated perspective corrections to Lightroom. Previously, you could use the manual tab in the Lens Corrections panel to make distortion and perspective corrections. With the new Upright tool’s Level, Vertical and Full options in the Lens Corrections “Basic” tab, you can now make complicated perspective corrections with just one click. Check out my before and after screenshot (below) of a photo I hit with the Upright “Auto” adjustment. For a more detailed explanation of the new Upright tool, check out the Adobe demo video below the screenshot. A couple of other improvements you’ll find in the Lightroom 5 Beta are a new “Slideshow” Module (see screenshot, below) and improved photo book creation. I haven’t seen it in action but there’s also something called “Smart Previews,” which allow you to edit in Lightroom without actual access to your original files. If you’re like me, and all of your photos are saved on external drives, you’ll understand why this is a big deal. Smart Previews will allow you to edit photos without being plugged into your network or external drives so you can sort and edit anywhere, anytime. 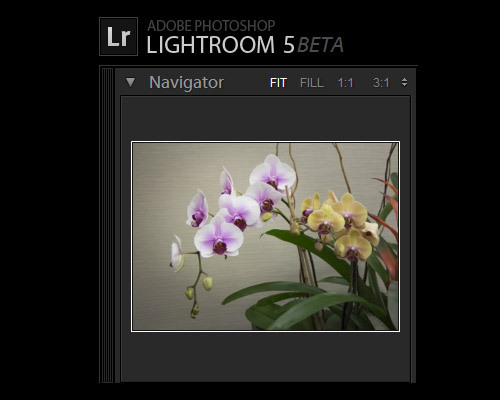 It’s important to remind everyone that this is a beta version of Lightroom 5. That means it’s a work in progress. Adobe has made it available so they can collect feedback while they refine and complete the final version, which should be available this summer. If you do install it, don’t be surprised if you encounter errors or stability problems. I have already seen reports of the Lightroom 5 Beta crashing, although it’s worked fine for me. If you do want to check it out, it’s a good idea to create a new, separate test library and only use copies of photos. That’s what I did. Adobe discourages people from using it for production work. I’ve been surprised and impressed with each new iteration of Lightroom and this new beta gives us an exciting peak at what’s in store with Lightroom 5. The Advanced Healing Brush, Upright and Radial Gradient tools look great and the addition of a Slideshow Module makes perfect sense. It wasn’t given a lot of attention in Adobe’s announcement but I think the ability to edit without direct photo access via Smart Previews may turn out to be one of the more important improvements in Lightroom 5. For those of us who travel a lot or aren’t always in the office, being able to sort and edit photos without being connected to our network will make life a lot easier. Still the funereal grey on grey interface. (yes I reallse why ) How hard is it to give some other options ? Each time I download a trial, I hate that colour and dump it again. For me the killer feature has been the improved clone/heal painting. 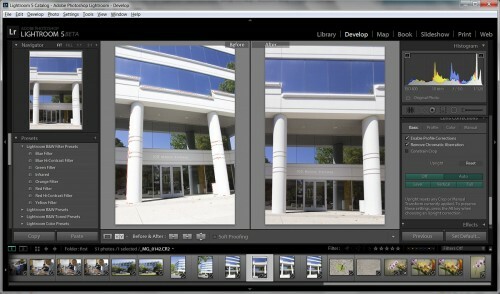 Removing an out of focus branch that would have taken a trip to PS is now a simple drag and paint edit in LR5. That alone makes it worth it for me.